The discovery of supposedly blood-drained animal carcases hits the cryptozoology headlines with monotonous frequency (I noticed yet another one being discussed online just a few days ago), accompanied by the usual (and sometimes decidedly unusual) media speculation as to what diabolical entity could have been responsible for such a hideous, unnatural act. In reality, of course, no such entity – diabolical, vampiric, or otherwise – is responsible, because it is highly unlikely that such carcases really are blood-drained (variously termed desanguinated or exsanguinated). They merely look as if they are, particularly to the pathology-untrained eye, which is a very different matter altogether. Over the years, many culprits for such unsavoury activity have been proposed – the chupacabra or goatsucker being the favourite identity if said carcases have been discovered in the New World; and various mystery carnivores, such as escapee/released big cats and even the (very) odd absconded far-from-home thylacine, if elsewhere. 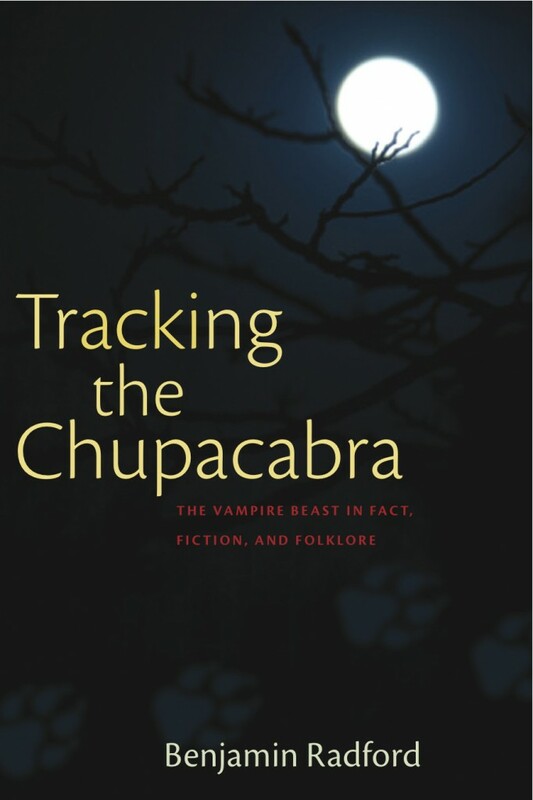 Ironically, however, the true nature of these carcases has already been investigated, uncovered, and publicly exposed for all to see and read in a quite recent cryptozoology book that I heartily recommend to everyone – Ben Radford's superb Tracking the Chupacabra: The Vampire Beast in Fact, Fiction, and Folklore (University of New Mexico Press, Albuquerque, 2011; ISBN 978-0-8263-5015-2). So why such carcases should continue to perplex other researchers and the media, as indeed they still do, thoroughly baffles me. 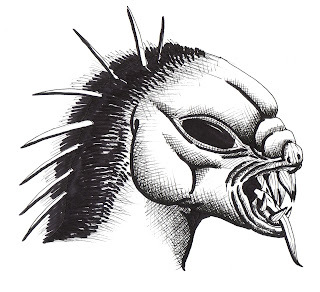 "In modern times, very few cryptids have risen from obscurity to international celebrity with such alacrity as the chupacabra or goatsucker (indeed, I can only think of one other offhand – the Mongolian death worm). Prior to the 1990s, it was a Hispanic oddity, now it is a by-word for mysterious entities of the deliciously dark and sinister kind - emblazoned as a snarling, fiery-eyed anti-hero upon t-shirts sold in every corner of the planet, and gorily eviscerating and exsanguinating its hapless victims in saliva-dripping glee as the toothy vampiric star of countless movie and video flicks viewed worldwide. "But what, precisely, is the chupacabra, and where did it come from? Indeed, does it even exist? Over the years since it first began hitting the media headlines in Latin America and then steadily onward and outward until its infamy became a global sensation, this monstrous marauder has been described in countless different ways by its supposed eyewitnesses – likened to just about everything, in fact, from a spiky-backed bipedal pseudo-kangaroo with wings and spinning hypnotic eyes to a hairless quadrupedal blue dog with mangy demeanour and long savage jaws. 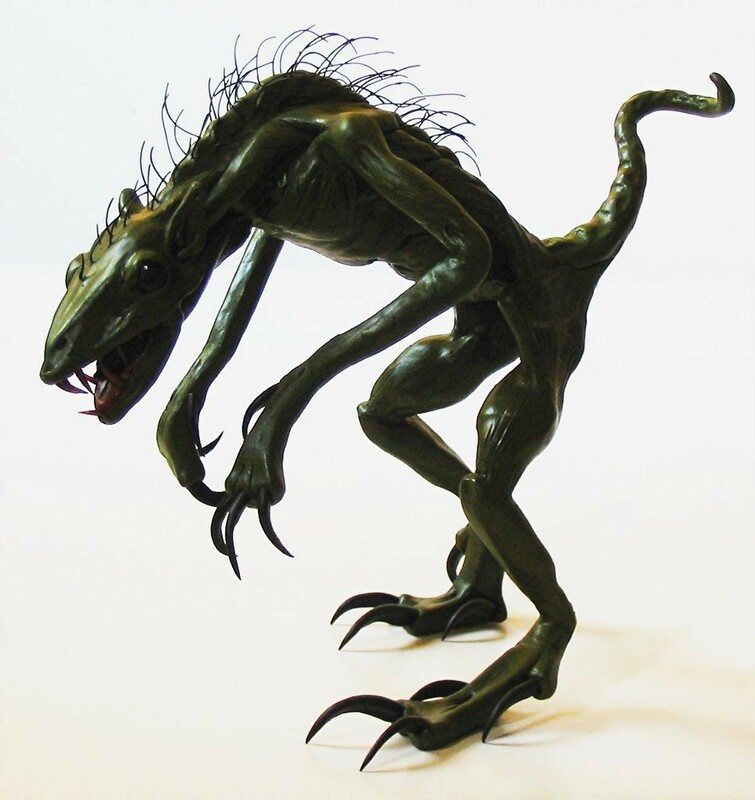 Its origin has attracted equally diverse, dramatic speculation too – a spontaneously-mutated freak of nature, an absconded scientific experiment gone wrong, even a decidedly inimical extraterrestrial visitor. "It was high time, therefore, that this paranormal Proteus received an in-depth, critical, scientific examination, seeking both its identity and its origin, and thanks to this riveting book, that is exactly what it has received. As in his previous works, Radford has painstakingly stripped away the layers of glamour, hearsay, folklore, and media hype to reveal what he believes to be the truth behind the lurid crypto-legend, the reality at the heart of this unlikeliest of contemporary icons, and I for one consider that he has achieved his goal. "Along the way, as with all of the most thorough investigations, there have been a number of stark, surprising revelations. Not least of these, following his forensic examination of the case in question, is Radford's comprehensive dismembering of the first major, pivotal eyewitness report (which had almost single-handedly launched the chupacabra phenomenon in fully-formed state upon an unsuspecting world). "Also well worthy of mention here but without giving away the all-important details is his documentation of the long-awaited explanation for why supposed chupacabra victims' carcases are often described as being entirely drained of blood; as well as how another perplexing entity, the reptilian humanoid of Thetis Lake in British Columbia, Canada, was lately exposed as a hoax – a significant event, yet which had not previously received widespread coverage. Those pesky blue dogs sans hair reported from Texas and elsewhere in recent years and even represented in the flesh by one or two preserved corpses also receive Radford's full attention, revealing their identity to be intriguing but far less outstanding than media reports would suggest. "Radford's central thesis, however, concerns the remarkable but hitherto uncommented-upon similarities between the chupacabra and the alien star of a certain science-fiction film whose release occurred just prior to the first, crucial eyewitness report of el chupa to attract major media attention. Was the latter shaped by the former? Judging from the evidence presented here by Radford, this would certainly seem to be the case, influencing everything written about and described for the chupacabra since then. "After spending far too many years in the headlines as a bloodthirsty monster with a rapacious appetite for victims and headlines in equal measure, it looks very much as if the chupacabra has finally met its match – assassinated not with a shotgun, but instead with sterling detective work. Consequently, I feel it only fair to warn you that if you like your newly-slain goatsucker served with a generous dollop of mystery and spiced with all manner of rarefied unsubstantiated rumours, you are not going to enjoy this book. If, conversely, you prefer it plucked raw and served cold, basted only by scientific detachment and common sense, it should be a veritable feast." 1) Some such reports documented by the media are not first-hand but rather second-, third-, or even fourth-hand, and are thereby susceptible to distortion and fabrication of the 'Chinese whispers' and foaflore (friend-of-a-friend lore) nature. 2) Reports that are first-hand originate directly from those who have discovered such carcases, but such persons, e.g. farmers, ranchers, do not generally have medical or forensic expertise, and the carcases themselves are very rarely examined by anyone who has. So their claims that the carcases lack blood are not scientifically substantiated, and are therefore merely unsupported personal opinion, i.e. supposition. 3) If little blood is seen on or around the carcase, a layman discoverer is likely to assume that the carcase has been desanguinated, and even more likely to assume this if he should actually cut the carcase open and find little or no evidence of blood inside it. However, this apparent absence of blood is in reality no such thing. When an animal (or human) dies, rigor mortis is accompanied by livor mortis – a lesser-known process in which the carcase's blood soon begins to settle via gravity in the lower, underneath areas (which thus acquire a dark reddish-purple hue) and coagulates there, both inside vessels and in tissue surrounding vessels from which it has leaked. This only takes a few hours at most, so unless someone finding a carcase turns it over, thereby revealing the dark hue of the tissues underneath where blood has collected and coagulated (and not many people would see any reason to do so, especially with a hefty, smelly carcase like that of a dead cow or horse), the activity of livor mortis will remain hidden from view. All that will be seen is the carcase's much paler upper portion, from which blood has drained out, down into the concealed lower portions underneath. 4) Even if the carcase is turned over, if it has been lying on hard or rough ground the blood vessels in its undersurface tissues will have been compressed by the ground, thus restricting the settling of blood (i.e. livor mortis) there. So this surface will appear paler (and hence more bloodless) than would otherwise have been the case. 5) If the carcase is of an animal with dark and/or very hairy skin, livor mortis-induced discolouration will not be discerned anyway, even if the carcase is turned over, unless painstakingly examined by a medical pathologist or veterinarian via a full autopsy. 6) If a carcase is cut open and little or no blood emerges, this is due merely to the fact that it has had time to become fixed in the tissues and clotted. In short, the blood is still there, but it has simply dried up and its water content evaporated. 7) To determine scientifically the extent of blood loss, or whether there has actually been any blood loss at all, from a carcase, a full-scale formal necropsy would be required, performed by a qualified medical pathologist or veterinarian, which rarely happens with animal carcases found by farmers and ranchers on their lands, if only because of the high fee that the farmer or land-owner would be required to pay in order for such a procedure to be conducted. 8) One important indicator of significant blood loss is noticeable paleness of the internal organs, but again, unless the carcase has been professionally necropsied, this would not be readily perceived. 9) Crucially, in cases where supposedly desanguinated carcases have been examined by medical or forensic experts, they have not observed anything that they have considered to be anomalous – everything present has been in accord with their professional experience of the appearance of corpses, externally and internally. Perhaps the best-known example of this is the work of Dr David Morales, a Puerto Rican veterinarian with the Department of Agriculture. Despite having examined 300 supposedly desanguinated animal carcases that had been blamed upon the chupacabra in Puerto Rico, he found no evidence whatsoever to support such a claim. On the contrary, he found lots of blood inside the carcases, with no sign of vampirism, but plenty of signs of the animals having been attacked and killed by normal, mundane predators, such as dogs, monkeys, and birds. In short: the blood-draining, vampiric activity of the chupacabra and other predators is a fallacy, engendered by a lack of specialised forensic, medical knowledge by those discovering and observing the carcases, as well as by exaggerated, inflamed media accounts. So the next time that you read about a mysteriously desanguinated animal carcase, remember the above checklist, and if the carcase hasn’t been subjected to a thorough autopsy by a qualified pathologist or veterinarian, the chances are that it will be its bloodless state that is non-existent, not its blood. For full details regarding the alleged desanguination of animal carcases, please do read Ben's fascinating book, Tracking the Chupacabra – a compelling, eye-opening, and indispensable foray into the chupacabra's origin, as well as the myths, and the many fallacies surrounding this modern-day cryptozoological megastar. This was an invaluable and unique section in the book. I didn't think about the physiology aspect of this. I also loved the book and consider it a classic investigation with a satisfyingly sound ending (rare for cryptids). It is also important in that it considers the media contamination we get from cryptid reports. It is one of the best crypto books out there. In 1984, the book Mute Evidence, by Daniel Kagan, and Ian Summers covered the exsanguination issue very well. They mentioned the role small predators play in nibbling away soft tissues and lapping blood of a fresh carcass. I agree that Radford has given the best explanation of the chupacabra, even though an occasional actual cryptid may be involved. Perhaps a bigfoot? Really Radford's explanation is one of the greatly satisfying solutions to cryptozoological mysteries. I completely agree that the carcasses are not really exsanguinated. 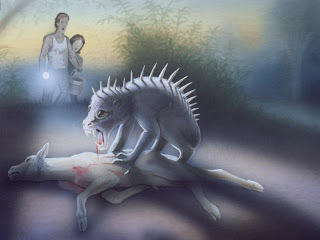 However, I do think that Chupacabras actually exist. I think that they are large, predatory iguanid lizards that walk bipedally with erect hind limbs. But I don't think that they are responsible for the majority of the animal mutilations, though. It is probably mostly feral dogs who are responsible for that; the Chupacabras only get blamed for it. Dale Drinnon has written a lot about these creatures on his blog, the Frontiers of Zoology. It is really very fascinating. Maybe I will get the book! As always, it's been a fascinating read, Dr. Shuker. I'd never considered the blood-pooling element before -- but I guess a lot of people missed the boat on that. Your blog is really amazing -- from the well-written, heavily-detailed descriptions to the variety of images in diverse styles from different sources. I'm so glad I discovered it today.